“Lessons from the Father” details the seriousness and intensity with which the son is learning how to strategically handle his coup stick by his highly respected and experienced father. The young man is wearing a northern plains type, dyed buckskin war shirt. The triangular neck flap indicates that it was Cheyenne made. It has a small amount of trade bead trim, but the majority of the decoration is quill work, indicating that it was probably made prior to 1840. His coup stick is decorated with otter fur and an eagle feather. In general, it was more prestigious to touch an enemy with a coup stick than to kill him. 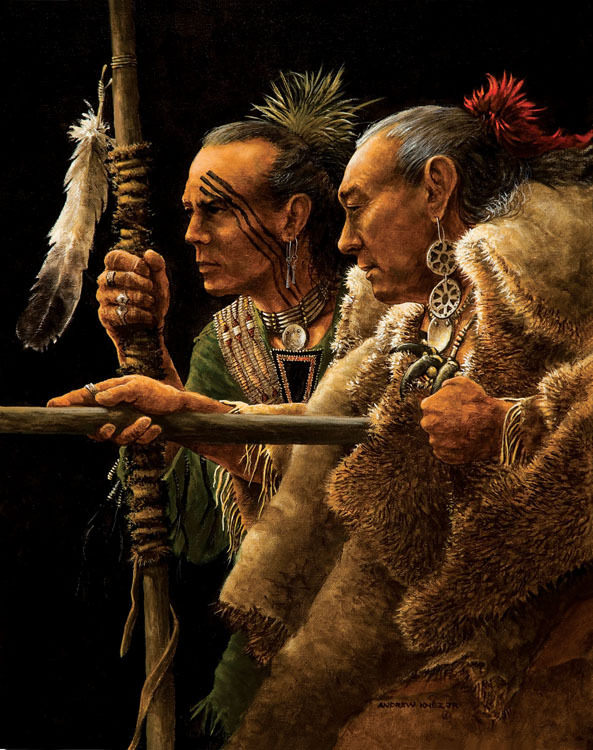 The use of eagle feathers to denote brave deeds had special rules and varied only slightly in most tribes. The Cheyenne claimed that “An old woman in a cave” told them long ago how to make a “Coup” or “Medicine Stick”. This stick helped to protect its’ owner from enemy weapons and was normally handed down from father to son.